As the U.S. and the Soviet Union developed and enhanced their arsenals during the Cold War arms race, both experienced a number of nuclear accidents. Since 1950, the Defense Department has reported 32 Broken Arrows. Three of the most notable U.S. incidents involving thermonuclear weapons are detailed below. At 11:50 a.m. local time on May 22, 1957, a B-36 aircraft jettisoned an unarmed Mark 17 ten-megaton hydrogen bomb over Albuquerque, New Mexico. The thermonuclear device, weighing 42,000 pounds, was being transported from Biggs Airfield in Texas to Kirtland Air Force Base just miles south of Albuquerque. Accounts of what caused the incident vary, but one version suggests that a crewmember in the bomb bay was jolted by sudden turbulence. He grabbed hold of the manual bomb release lever to steady himself, causing the weapon to fall through the closed bomb bay doors and plummet to earth. The nuclear chain reaction necessary to set off the bomb did not occur because the bomb’s fissionable plutonium component was stored separately aboard the aircraft. However, the device’s conventional explosives detonated, leaving a crater 12 feet deep and 25 feet wide on an uninhabited area of land owned by the University of New Mexico. The Field Command division of the Armed Forces Special Weapons Project, responsible for recovery and cleanup operations, reported the incident’s only casualty was a nearby grazing cow, and found that radioactive material did not spread beyond one mile of the crater. In the early morning of January 24, 1961, a B-52 bomber carrying two Mark 39 nuclear weapons crashed near Goldsboro, North Carolina. The aircraft was a part of a Strategic Air Command (SAC) mission designed to keep a significant number of bombers in air at all times, so that in the event of a Soviet first strike they would not be damaged or destroyed. The operation necessitated that the aircraft be refueled in mid-air. At midnight on January 23-24th, the B-52 rendezvoused with a tanker to refuel. The tanker crew observed that the aircraft was leaking fuel from its right wing, and notified its commander, Major Walter Scott Tulloch. SAC instructed Tulloch to assume a holding position until most of the plane’s fuel was lost and prepare for an emergency landing. However, the leak quickly worsened, and as the plane descended, the pilots began to lose control of the aircraft. The crew attempted to eject. Of the eight crew members on board, five were able to parachute to safety. Sergeant Francis Roger Barnish, Major Eugene Holcombe Richards, and Major Eugene Shelton were killed. The crash resulted in the release of two 3-4 megaton hydrogen bombs. One of the bombs fell straight down and crashed into a muddy field at a rate of 700 mph, plunging the weapon deep into the ground. Its tail was found 20 feet below the surface. Though complete excavation of the weapon was abandoned, much of its nuclear material was recovered. Some uranium remains at the crash site, where the US Air Force performs regular inspection to test for radioactive contamination. To date no radiation has been detected. The second weapon’s landing remains controversial to this day. Unlike the first, the second bomb’s parachute opened, indicating that its arming sequence was initiated. Eventually, the bomb’s parachute got stuck on a tree, leaving the weapon mostly intact. Today, experts differ on how close the weapon came to detonating and how many of the arming procedures it underwent. One analysis holds that the weapon only did not detonate because its arm/safe switch, controlled by the pilot, was still set on safe. Secretary of Defense Robert McNamara reported that, “by the slightest margin of chance, literally the failure of two wires to cross, a nuclear explosion was averted.” A 1969 expert analysis reiterated, “One simple, dynamo-technology, low voltage switch stood between the United States and a major catastrophe!” Others contend that the bomb was in fact not close to detonating. 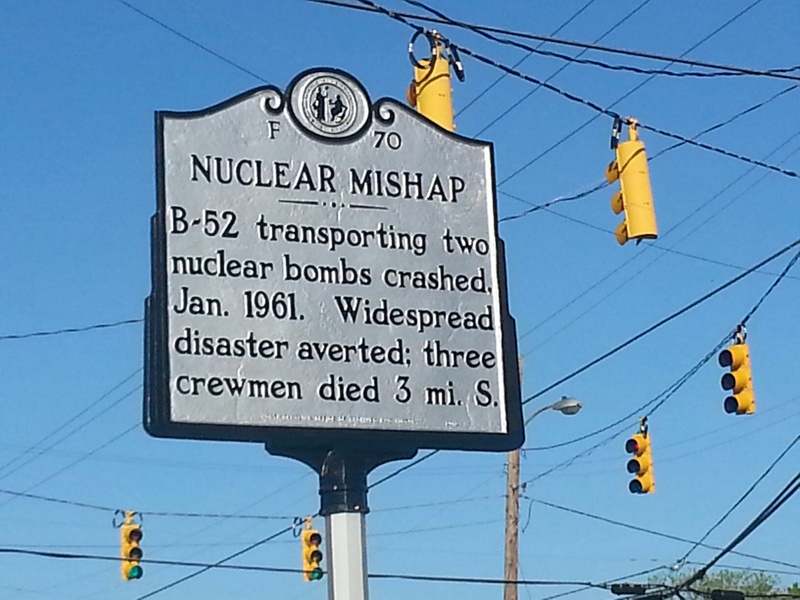 A road marker labeled “Nuclear Mishap” in Eureka, NC, a town three miles north of the crash site, commemorates the incident today. On the morning of January 17, 1966, a B-52 bomber carrying four Mark 28 hydrogen bombs collided with a KC-135 refueling aircraft near Palomares, Spain. The B-52 was part of the United States Air Force’s Operation “Chrome Dome,” in which Strategic Air Command constantly flew bombers armed with thermonuclear weapons in order to provide the US with a first strike capability over the USSR in event of a “hot” confrontation. 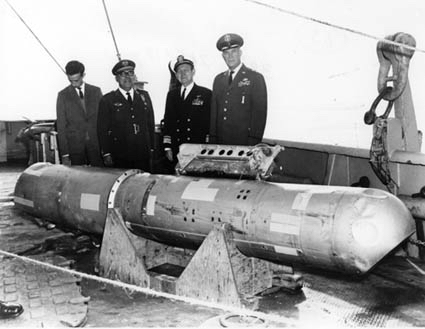 Approximately 24 hours after the collision, U.S. servicemen and disaster control teams located, secured, and recovered the three hydrogen bombs that fell on land. 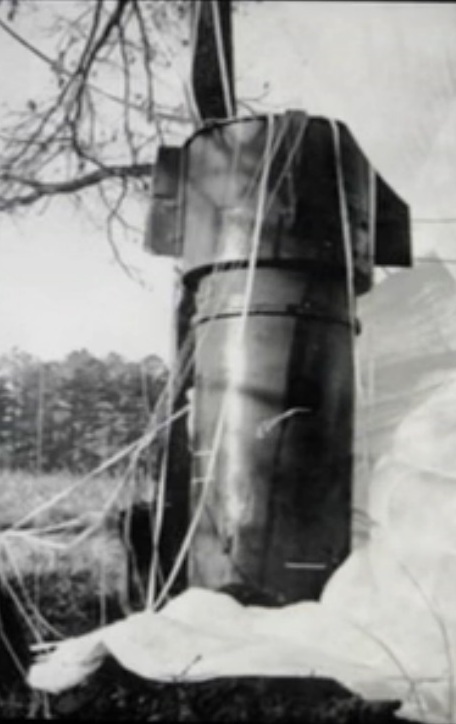 One bomb deployed its parachute as designed and landed harmlessly, in what former Secretary of the Air Force Thomas C. Reed calls “a silent testimonial to the care of those who designed, engineered, and built those U.S. nukes.” However, the conventional explosives in two bombs went off, contaminating surrounding farms (see below). The fourth bomb parachuted several miles off the coast and landed in the Mediterranean Sea. The U.S. Navy launched an intensive three-month search involving nearly 12,000 people, several ships, and two submarines, the Alvin and the Aluminaut. The bomb was ultimately found and extracted from the ocean on April 7. The following day, reporters were permitted to photograph it aboard the U.S.S. Petrel. 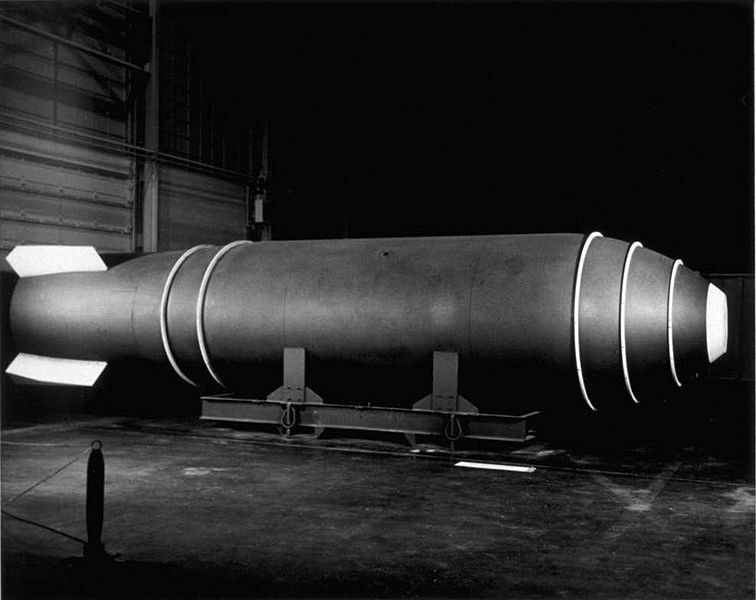 The New York Times reported it was the first time the U.S. military had displayed a nuclear weapon to the public. 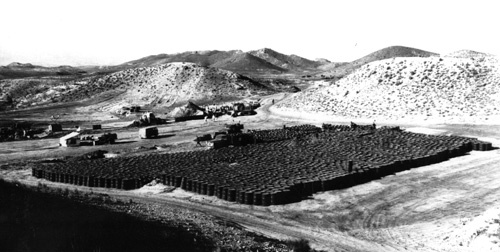 The U.S. military launched Operation “Moist Mop” in Palomares to remove contaminated soil from the bombs’ release of plutonium. Author Barbara Moran describes, “To clean it up, they decided to remove the contaminated dirt from the most contaminated areas.” This involved removing topsoil from irradiated areas and shipping it to storage facilities in the United States. "Nuclear Mishap" marker in Eureka, NC. Image courtesy of RJHaas/Wikimedia Commons. 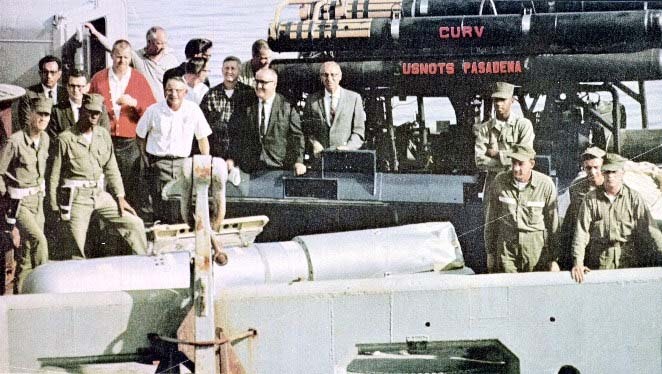 Crew members on the USS Petrel after the recovery of the missing H-bomb, 1966. 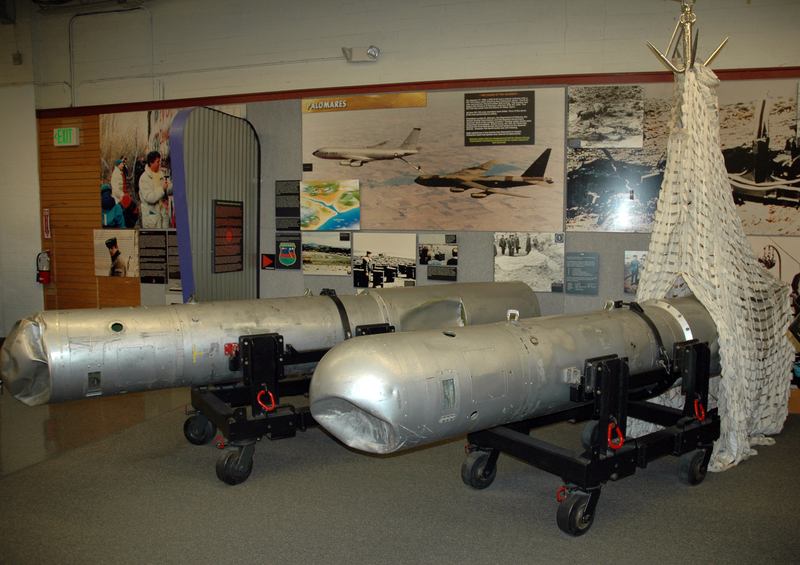 Two of the recovered Palomares bombs at the National Museum of Nuclear Science and History. Image courtesy of Marshall Astor/Wikimedia Commons. Burr, William. “New Details on the 1961 Goldsboro Nuclear Accident.” National Security Archive Electronic Briefing Book No. 475. June 9, 2014. -------. “New History of Nuclear Weapons Control (and Lack Thereof) Cities National Security Archive Documents on War Plans, Nuclear Accidents, and Command Systems.” National Security Archive Electronic Briefing Book No. 442. October 7, 2013. Krepon, Michael. “Broken Arrows.” Arms Control Wonk. December 26, 2011. Reed, Thomas. At the Abyss: An Insider’s History of the Cold War. New York: Presidio Press, 2005.